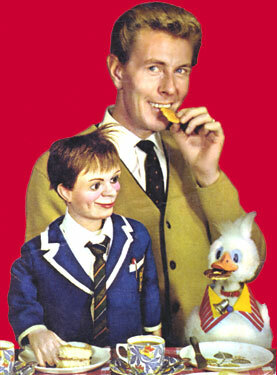 Already famous for his ventriloquial figure, "Lord Charles", Ray Alan introduced these new characters "Tich & Quackers" for a much-loved Children's TV series of the 1960s. Quackers the Duck was operated by Tony Hart of "Vision On" fame. The puppets were made by the brilliant sculptor and leading British ventriloquist puppet-maker, Leonard Insull (1883 - 1974). The original Tich & Quackers are now on display as part of the Len Insull Exhibition at Bantock House, near Wolverhampton. The above picture is from the cover of a 1968 Children's Annual. Characters Copyright Ray Alan Enterprises.